Uphold the candid spirit of parks, playgrounds and other spaces with Lexington trash receptacles. 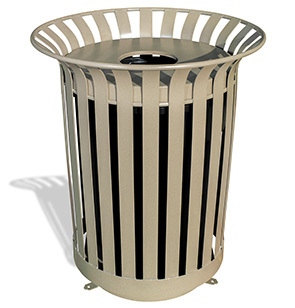 The round 36 gallon receptacle features a classic vertical slat design with user-friendly side-door access. The convenient 8" diameter opening encourages the proper disposal of litter items. Finished in a non-corrosive thermoplastic coating, this premium 36 gallon Lexington trash receptacle is ideal for both indoor and outdoor applications. Adding to the unit's versatility—a choice of flat top, ash urn or rain bonnet lid, each designed to deliver appropriate coverage to keep disposed contents discrete, deter unwanted pests and prevent water collection as a result of weather conditions.